With one exception, my entry garden has been delightful this week. 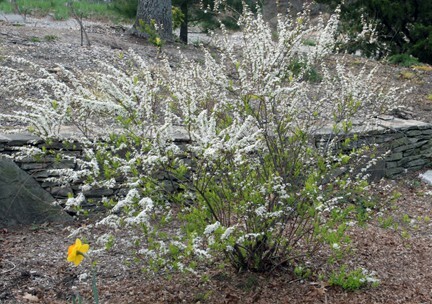 The Spirea ‘Ogon’ at the end of the garden was in full bloom, with flowers and yellow foliage wispy enough to compliment, not dominate, the spring garden. Blue Anemone blanda flowers open during the day and close at night, and the daffodils that my mother sent as birthday presents are all in bloom. It is still a new garden, designed to have room for the Anemones to self-seed, daffodils to multiply, and annuals to be planted in the open spaces. All in all it’s a lovely first year display. Last fall I added a few Aurinia saxatilis plants. I love basket-of-gold not only for the intensely yellow spring flowers, but because the grayish foliage is attractive for the rest of the summer and fall. Two weeks ago the small plants that I placed in the garden last September burst into bloom. Yesterday, one of these plants collapsed. Sudden death occasionally happens in the garden although I think we tend to notice a problem only when the plant is in terrible shape. Perhaps this Aurinia had been struggling for several days… this plant does not like to be too wet and it is prone to root rot in damp soils. 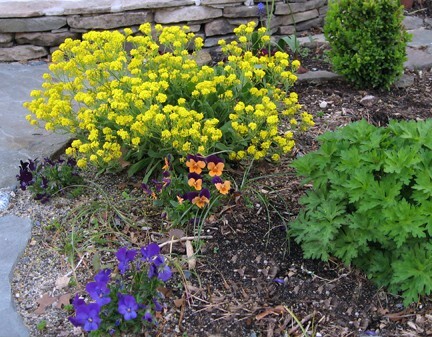 For this reason, basket of gold is a good plant to place in rock walls or sandy slopes. It’s likely that this plant was, for some reason, less able to tolerate the previous week’s daily rainfall. Perhaps the soil in that part of the garden isn’t as well drained as the area three feet away, where another Aurinia thrives. Maybe this plant was more stressed by the winter, something ate part of the roots, or the dog ran over it and cracked the stem. Callers to GardenLine, and those attending my talks, often ask why one of their plants does well and another “that was treated the exact same way”, does not. We want to know what the problem was so that it can be avoided in the future. Sometimes we can figure out what went wrong and other times the demise of a plant remains a mystery. I used to respond to such questions with a little humor. “You know,” I would say, “Lillian Carter raised two sons in the same household. One became President Jimmy Carter, and the other…” Over time I saw that those that were Democrats tended to smile, and those that were Republicans would start to grouse about Jimmy Carter, missing my point completely. I guess that sometimes it’s best to stay focused on the garden. 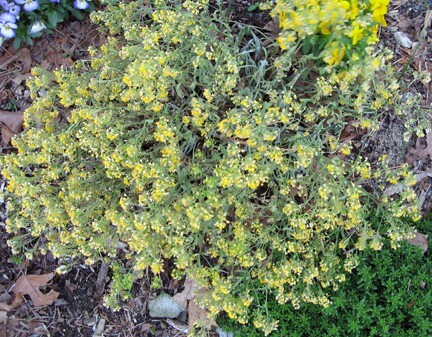 Today I’ll cut the wilted Aurinia down, and apply Organica’s Plant Growth Activator to the soil. I’ll be spraying my Hollyhocks with Serenade, to suppress the rust that they are prone to, so I’ll probably spray the basket-of-gold as well. Perhaps the Bacillus subtillis in these products will help. If this Aurinia doesn’t bounce back, however, I’ll plant something else in that location. As I’ve often said, our gardens do not look attractive because everything that we’ve planted thrives. No… our gardens, and our lives, become beautiful because we keep planting. Spirea 'Ogon' adds color to the garden in three seasons: white flowers in spring, yellow leaves in summer, and golden peach fall foliage. This basket of gold suddenly has dried flowers and shrunken leaves. A sick plant. This plant, just three feet from the one that has collapsed, is thriving.